The 100 Club - what is it? The 100 Club - RESULTS! The North West Counties Squash League & Heswall Teams. The North West Counties Squash League is one of the largest competitive squash leagues in the world and has been in existence for over 50 years! The main 'winter' league runs from September through to April. Clubs in the North West compete in 5 divisions, operating a pyramid system containing around 25 to 30 sections, with some 2000 players involved. The NWCSL also operates a 'summer' league during May to July for clubs in the areas covering Manchester, South Manchester, North & Mid Cheshire. Results from the matches, which are played either on Thursday evening or Tuesday evening for Division 1, are 'posted' via this web site using the ResultsZone software by either Club Administrators or Divisional Representatives. This system also allows clubs to easily view match results and team position in the leagues. Recently, a new player ranking system has been added, which ranks all the players in the league across all divisions and sections, rather than just the players in each of the individual division sections. Just some of the wonderful Heswall Ladies! View the teams fixture list and results on results zone. 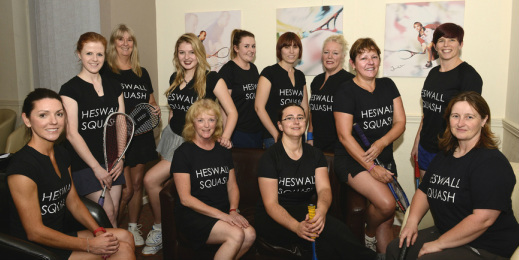 We currently have two teams in the Cheshire Leagues and the number of Ladies playing squash & racket ball at Heswall is growing at an amazing rate! Matches are on a Monday night beginning at 7:30pm and end approx 9.00 pm, then we all muck in for tea! Team players are expected to stay for the duration of matches, marking games and generally providing hospitality to their opponents if the match is at home. When there is no ladies match on a Monday there's a Ladies mix-in from 7:30pm. We try and keep match-fit throughout the year by attending the fitness sessions! 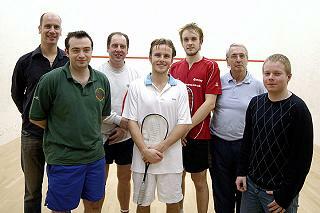 Peter Nicol, James & Malcolm Willstrop with some of the Heswall team players. Men's Teams Captain is Mark Griffiths. We currently have 6 teams in the Men's Merseyside League & our 1st team are playing in Division 1. First Division matches are on Tuesday evenings & other divisions play on a Thursday evening beginning at 7:30pm and typically finishing around 11pm with a meal after. ​New players are always welcome and should contact Mark for further info. There are always team "mix-ins" on Thursday evenings in the weeks preceeding the start of the season or when there are no officially scheduled games. 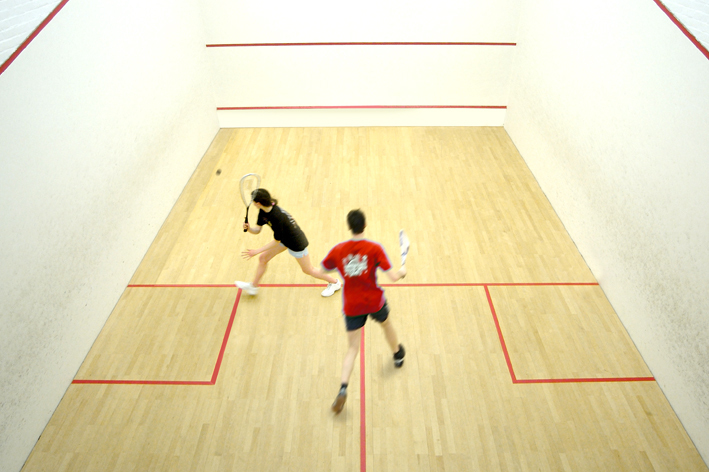 If you need it, you can keep fit out of the squash season and throughout the year by attending the fitness sessions! The club operates an internal league system with the opportunity to play regular monthly games against other members. Leagues are played on a calender month basis with 5 players per league, thus 4 games are playable with promotion and relegation applying. The winner of each division is also awarded a bar voucher each month. Leagues are mixed and it's an ideal way for new members to integrate into the club from both a social and playing side. Don't forget to check out the Box League results each month in the Members' Area on this website! HSRC Junior Squash - Sunday afternoons during term time! ​HSRC Junior sessions are going from strength to strength with numbers at the weekly training increasing every week. The sessions are supported by a rotation of 12 active coaches who provide players with the skills to improve. The sessions are on Sunday’s during term time from 5:30pm - 6:30pm. HSRC Juniors competing in the North-West Junior Closed competition at the National Squash Centre, Manchester.